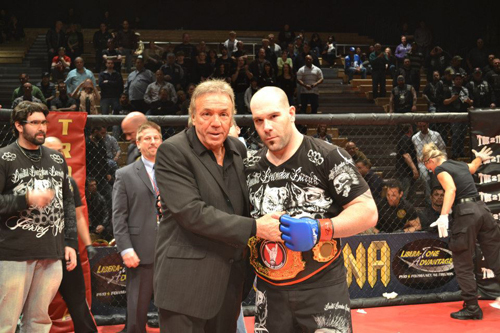 Lou Neglia’s Ring of Combat XLVI took place last Saturday night at the Tropican Casino Hotel in Atlantic City, New Jersey. The crowd was standing room only and the atmosphere was electric. And as usual, the fights lived up to the hype. It was one of the best ROC events I’ve ever seen. Here’s a recap of the evening. The show opened with a very intriguing matchup. Stephen Regman, out of the Tiger Schulmann camp, made his professional MMA debut against Eddie Lenoci of Serra-Longo, who was 1-0 in his pro mma career. I’d ring announced both of these guys in the amateurs, and knew that the bout would be a tough, closely fought battle. Once the bell rang, they didn’t disappoint. Each fighter had his moments in the cage, and both displayed well rounded skills. The scrambles were intense and the striking had fans on their edges of their seats. The bout was scheduled for two four minute rounds with a third round tie-breaker if needed. After the two rounds, the fight was declared a draw, and the fighters came out for the third round. It was another very even round, with both fighters landing big shots. Crazy Eddie Lenoci came out on top on two of the three judges’ scorecards to earn a split decision victory. The second fight mirrored the first in that you had 1-0 pro Leodegario Muniz taking on Cody Mooney, who was making his pro debut. This fight was a rematch–Leo and Cody had fought in the amateurs, with Cody winning a unanimous decision. Both fighters, as in the previous fight, had their moments, and this fight too went to a third and deciding round. Leo, who is trained by Justin Garcia, aka Master Chim of the Jungle Gym, started taking charge halfway through the third round, and went on to win the fight by unanimous decision. I would definitely like to see a rubber match between these two fine prospects. Next up was undefeated Tiger Schulmann fighter Julio Arce doing what he does best–remaining undefeated. He was 11-0 as an amateur and 3-0 as a pro going into his fight with Cory Simmons. Simmons was a game, tough opponent, but Arce was simply too much for him, stopping him in the second round by way of rear naked choke. 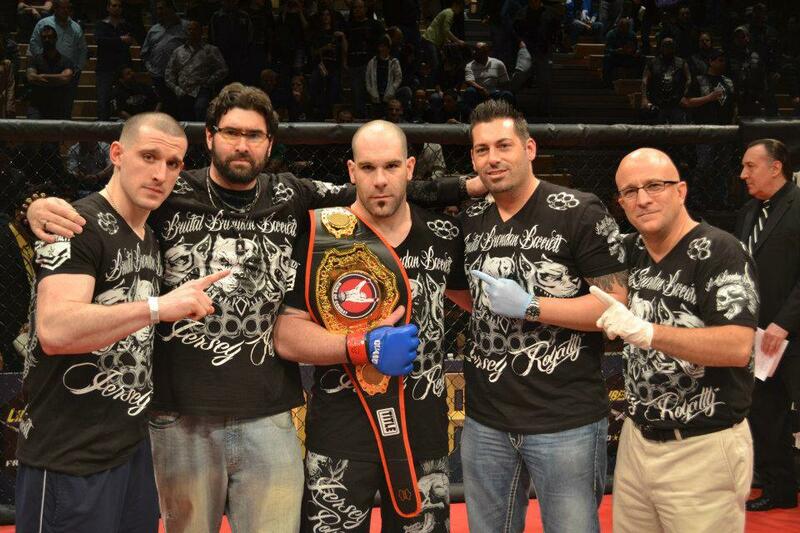 Lou Neglia prides himself on ROC fighters moving up into the UFC, and Julio Arce could very well be next. One disappointment on the card was the Robert Plotkin fight getting cancelled. Robert came ready to fight, but his opponent was apparently nowhere to be found at fight time and hence the fight was scratched. Tough break for Plotkin, but probably a wise decision on the part of his opponent. Another main card bout was Pat DeFranco, another Serra-Longo product, taking on tough Adam Townsend, who came up from Tennessee for the fight. Townsend, who was undefeated as an amateur with an 8-0 record, came into the fight with a 5-1 pro record, his only loss coming at the hands of top prospect Frankie Perez. In the fight with DeFranco, Townsend had his moments, but DeFranco landed the cleaner shots and consistently out-grappled Townsend en route to a unanimous decision victory. It was another fine performance by Pat DeFranco, who seems to be coming into his own now as a professional mixed martial artist. I’m already looking forward to his next fight. Next up was a fight I’d been waiting for. James Jenkins, making his return to the cage after a layoff of over a year. Like so many other fighters on the card, I’ve had the pleasure of ring announcing James several times and he is an absolute destroyer. James, out of the Serra-Longo camp, took on hard hitting Justin Steave. The fighters traded bombs in the first round and Steave caught Jenkins with a big right hand that momentarily stunned the Long Island fighter. But then Jenkins went into Matrix mode, moving his head and making Steave miss. By then Jenkins had shaken off the ring rust and began to take over. He finished Steave with a rear naked choke in the second round. James Jenkins is another prospect who I expect to see in the UFC. He’s an absolute beast. As I’ve mentioned several times, I’ve had the pleasure of ring announcing many of the fighters on this card back when they were amateurs. This includes “Hurricane” Shane Burgos and Ashure “Lion Heart” Elbana. I knew this fight was going to be intense, and it certainly lived up to the hype and more. Shane Burgos is known as a submission artist, but he has a great stand up game as well, and showed off his striking prowess against Elbana, stopping him in the first round via TKO. Elbana, out of the Extreme Fight Club camp, always lives up to his Lion Heart nickname, but he was just overmatched by Burgos, who fights out of Team Tiger Schulmann. Burgos looked the best I’ve ever seen him, and he appears to be destined for the UFC. He can strike, grapple and go to war in the cage, and I expect big things from him in the future. Awesome performance. This sounds like a amazing card so far, doesn’t it? Well, it got even better. Because next up was highly touted prospect Frankie Perez, taking on very experienced Muay Thai specialist Rafael Fagundes. Fagundes, who has knockout power in both hands, came charging across the cage and hit Frankie with a hard right hand, a punch that would have knocked out many mixed martial artists. The punch stunned Perez, but only for a split second. Frankie showed great recuperative powers and excellent instincts as he immediately shot in on Fagundes and secured a takedown. From there the fighters scrambled and were grappling against the fence. Fagundes was warned by referee Keith Peterson for holding the fence, but he didn’t heed the warning. Keith stood the fighters up and took a point away from Fagundes. This actually could have been in Fagundes’s favor, since his is a ferocious striker with an great stand up game. But Frankie, of the fighting Dead Serious MMA family, is trained by Ricardo Almeida, and spars regularly with Frankie Edgar, was in the zone. You could see the determination on his face as the fight commenced and he traded with Rafael before taking him down and choking him out for the victory at 3:30 of the first round. Frankie Perez showed in this fight why he is one of the hottest MMA prospects in the world right now. This was the first time he’d really been hit that hard and that clean, and he showed a great chin and world class perserverence in overcoming the adversity he faced. He remains undefeated as a professional, improving to 7-0, and in my opinion is a lock for the UFC. The next fight was a featherweight title elimination bout featuring undefeated Levan Makashvili (5-0) taking on tough Tom English. Makashvili, who is trained by BJJ blackbelt and former professional fighter Carmine Zocchi, made a huge statement with a second round one punch knockout Tom English. English, who trains out of Bellmore Kickboxing and Commack MMA, is as tough as they come, and it was a great feat by Makashvili to get the stoppage in such a sensational way. I can’t wait until he fights again. He is definitely one to watch. In the main event of the evening, Brutal Brendan Barrett defended his Ring of Combat Heavyweight title against Serbian fighter Miodrag Petrovich. In his last fight, Brutal Brendan, who always lives up to his nickname, needed only thirty seconds to knock out his opponent. In this fight, it appeared that he would beat that time as both fighters came charging out to the center of the cage and started throwing bombs. Then Barrett landed a short straight round hand that dropped Petrovich. Brutal then seized the opportunity and worked over his opponents with punches until referee Donnie Carolei jumped in and stopped the contest at 2:16 of round one. Barrett has always had excellent wrestling, but he’s been working hard on his boxing lately and it is really paying off. He has dynamite in his fists, and if he lands, it’s goodnight for any fighter. And he does land, which is why he is the undisputed Ring of Combat Heavyweight champion. This win is the fifth in a row for Barrett, whose career is really taking off. I am defintely excited to see what the future holds for this rising MMA star. It was a phenomenol night of fights, and the crowd took a long time to leave the venue. Everybody was buzzing after the main event. This show was just further proof that Lou Neglia’s Ring of Combat is one of the very top shows outside the UFC and Bellator. It is known as the American Idol of MMA, because it takes talented unknown fighters and showcases them to the world before they hit the big time. If you missed the event live, check out the replays on GFL.tv. After the jump is the official results from all the fights. 3 rds of 5 mins. Barrett wins via TKO referee stoppage due to unanswered strikes at 2:16 of round one. Makashvili wins via KO punch at 1:39 of round two. Perez wins via tap due to rear naked choke at 3:30 of round one. Burgos wins via TKO referee stoppage due to strikes at 2:16 of round one. Jenkins wins via tap due to rear naked choke at 1:21 of round two. DeFranco wins unanimous decision in three rounds 29-28, 29-28 and 30-27 Urso. Nichols wins unanimous decision in three rounds, all three judges 29-28. Arce wins via tap due to rear naked choke at 3:49 of round two. Muniz wins unanimous decision in three rounds, all three judges 29-28. Lenoci wins split decision in three rounds, 29-28, 29-28 and 28-29 Sinclair.